In memory of actress and humanitarian June Allyson, Kimberly-Clark Corporation (NYSE:KMB) today contributed $25,000 to the June Allyson Foundation to support research advances in the care and treatment of women with urinary incontinence. Allyson died on July 8, 2006. June Allyson in "Good News" (1947). Photo Courtesy Turner Classic Movies. 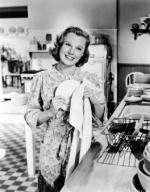 Turner Classic Movies (TCM) will feature an on-air tribute to girl-next-door actress June Allyson with six of her films and an installment of the TCM series Private Screenings. Allyson made more than 40 movies during her career, including Little Women (1949) with Elizabeth Taylor as well as The Stratton Story (1949), The Glenn Miller Story (1953) and Strategic Air Command (1955) with James Stewart. Her performance in the romantic comedy Too Young to Kiss garnered a Golden Globe in 1951. Turner Classic Movies, currently seen in more than 70 million homes, is a 24-hour cable network from Turner Broadcasting System, Inc. TCM presents the greatest motion pictures of all time from the largest film library in the world, the combined Time Warner and Turner film libraries, from the '20s through the '90s, commercial-free and without interruption. Expanding TCM's role as a curator of movie history, the network recently launched TCMdb, one of the Internet's most media-rich interactive movie databases. For more information, please visit tcm.com. 2006-2017 EMOL.org. Entertainment Magazine. All rights reserved.